It really doesn’t take a whole lot to whip up a decent meal for the family. You can chop up some veggies, dice some potatoes and mix in a few herbs to serve with your grilled chicken breasts, the perfect meal. And here is the deal; you don’t need a bunch of fancy gadgets to get the job done. You might think you need a pickle fork or banana slicer, but the reality is these are examples of useless gadgets you have in your kitchen that you may never use. They are a waste of money and a waste of precious kitchen space. In our last post, we gave you a few examples of useless kitchen gadgets. There are so many out there that we need another post to list them. 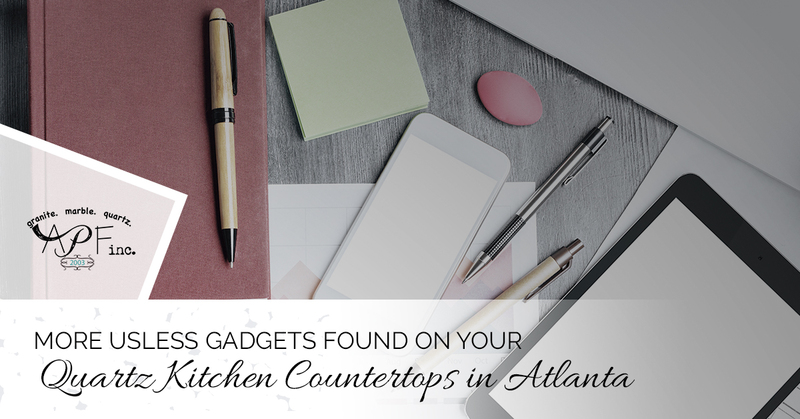 A Polished Finish, your source for quartz countertops in Atlanta, offers you even more useless kitchen gadgets to avoid. In case you have a difficult time distinguishing between kitchen shears and your arts and crafts scissors, you can purchase a pair of pizza scissors. Just make sure you don’t grab the pizza scissors by mistake when cutting out coupons form the newspapers. A bottle brush is basically a brush that you can attach to the neck of a bottle; like a bottle of barbecue sauce for example. This gadget is great if you can’t just pour the barbecue sauce on the meat and spread it with a separate brush. Otherwise, this seems rather useless. The hot dog and bun cooker is basically a toaster for hot dogs and hot dog buns. There are several reasons why this is a useless kitchen gadget. For starters, there are so many other ways to cook a hot dog that are better, like grilling or steaming for example. And you probably already have a toaster, one is likely enough. This is basically an adult version of an Easy-Bake oven. If you can’t toss your pizza in the oven just like everybody else, you need to take some cooking lessons. A pizza oven takes up a bunch of space and it a waste of money. If you ever lose your set of knives, a mushroom slicer will come in very handy. If you don’t plan on losing all of your kitchen knives all at once, then you can scratch this useless gadget off your want list. These are handy gadgets that hold your taco upright. Why anybody would need something like this is beyond us. Perhaps because spilled tacos are no laughing matter. This is a wonderful gadget that everyone should own. It is battery-powered and allows you to twirl spaghetti with the press of a button. This is a must for those who suffer from carpal tunnel syndrome or who are under the age of five. This is a device that helps you pour liquids into a glass. Of course, any able-bodied people out there are wondering why they would need help pouring orange juice or milk from a bottle into a glass. The description says this is a great gadget for women. You know, because they are so weak and frail. Nice try, go be sexist somewhere else. If you are too lazy to stand over the stove stirring your country gravy, you can drop a battery-operated device in it that will do the stirring for you. Of course, you won’t be around when your gravy gets scorched or boils over, so there are two reasons why this is a useless kitchen gadget. At first glance, a butter applicator might seem like a great idea. But after reading the reviews, it becomes quite clear that this is yet just another useless gadget that fails to deliver on whatever promise it makes. Nothing says class, style and sophistication like a battery-operated wine bottle opener. Way to impress your guests. When we saw this, we thought it was just an ordinary scoop, the kind you would use to coop sour cream or ice cream. But it happens to be made specifically for cookie dough, which makes it a useless gadget. The first thing you need to do when having your kitchen remodeled is call A Polished Finish. The second thing you need to do is get rid of all of your useless kitchen gadgets.